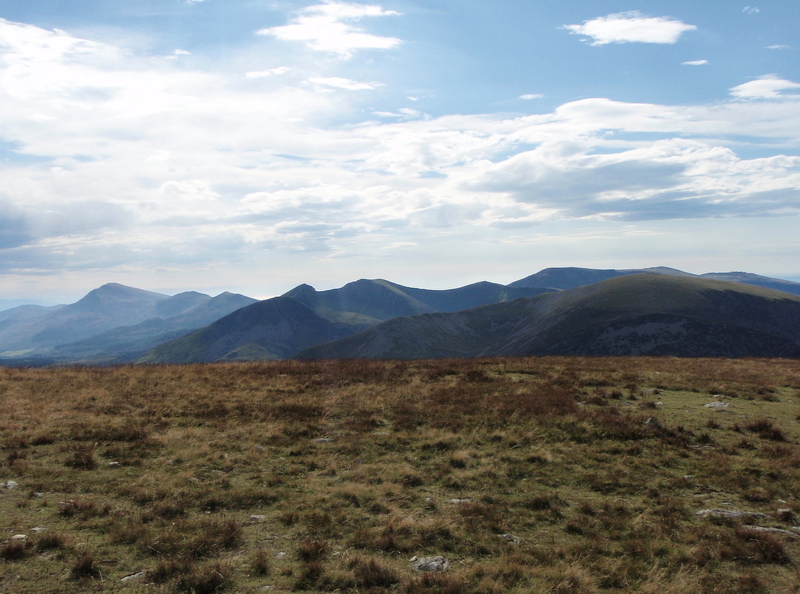 Our first (and only) visit to Moel Eilio was in March this year (see post #121) – the photos of the day show rolling green hills with the last remnants of winter snow, and no hint at all of the blizzards that were to hit North Wales two weeks later. 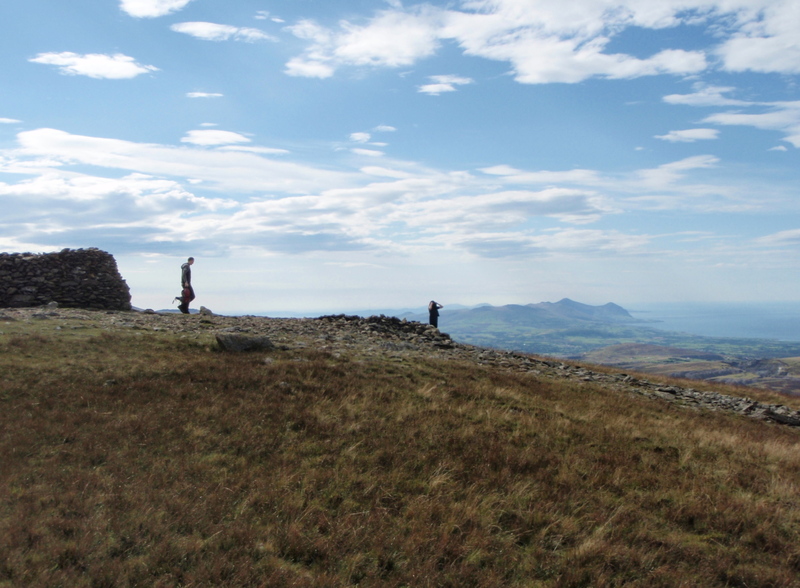 The views from the summit ridge were fantastic, and I knew we would return again and again …. From the start, the way is up…. …. with some more up …. 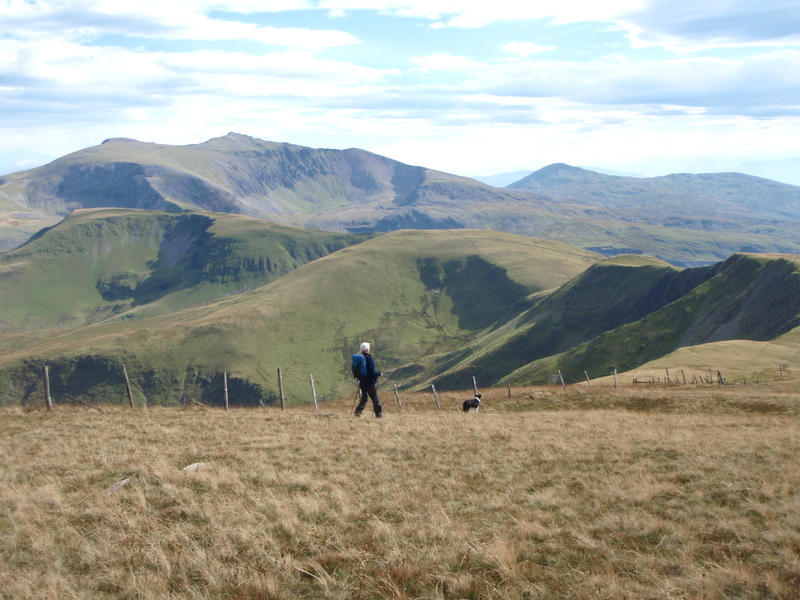 All that ‘up’ is worth it – if Moel Eilio doesn’t appear very interesting from immediately below, the views from the summit are stunning. 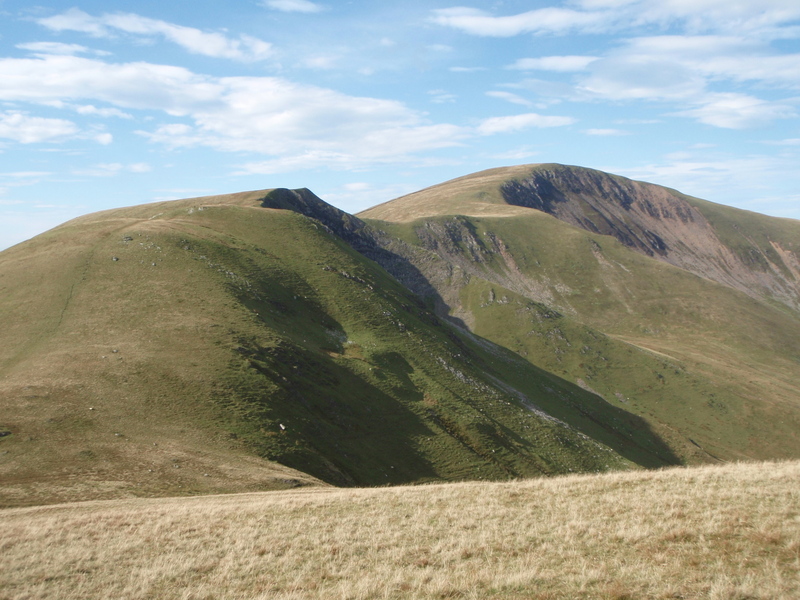 If the views are easy on the eye, the walking is easy on the legs, with a broad grassy switchback of a ridge leading off south. 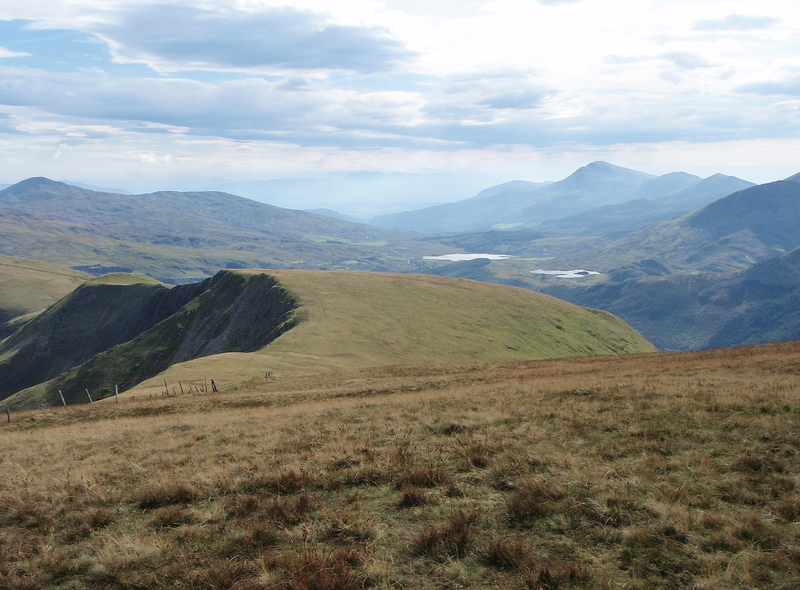 The crowded summit of Yr Wyddfa (Snowdon) is about 6 kms (3¾ miles) away in a straight line, but these hills are comparatively deserted. 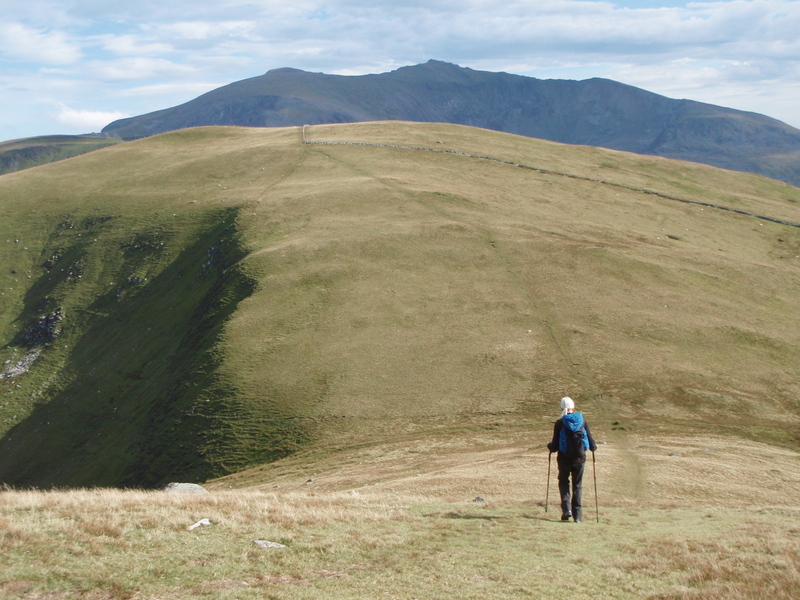 The easy terrain underfoot makes for fast progress, and the ridge is very popular with hill-runners. Then, suddenly, it’s all over. 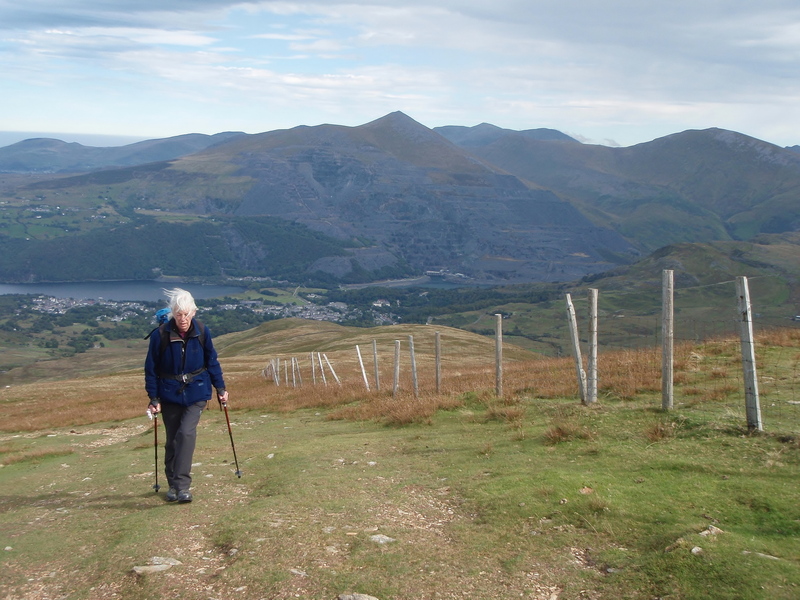 The last bit of ‘up’ to the summit of Foel Goch is followed by a short descent to a bwlch (pass) and even easier walking on a good bridlepath. 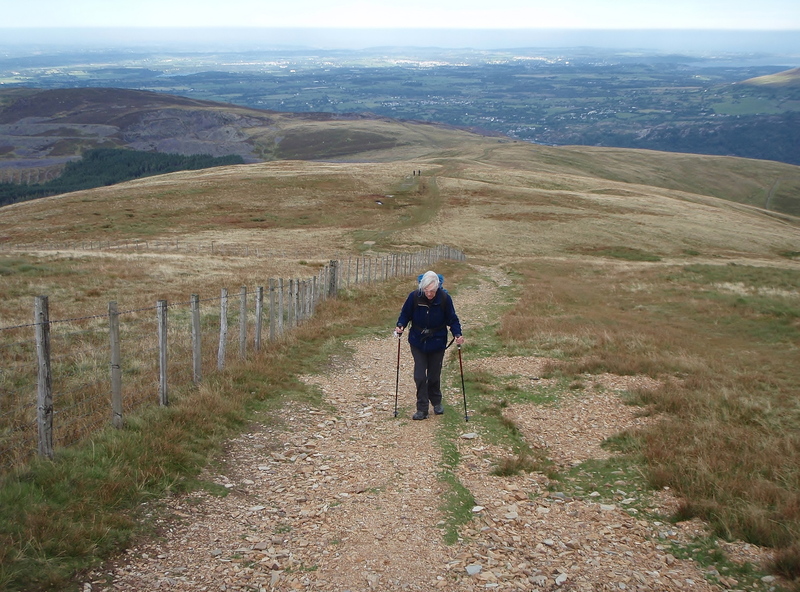 The last bit of ascent …. 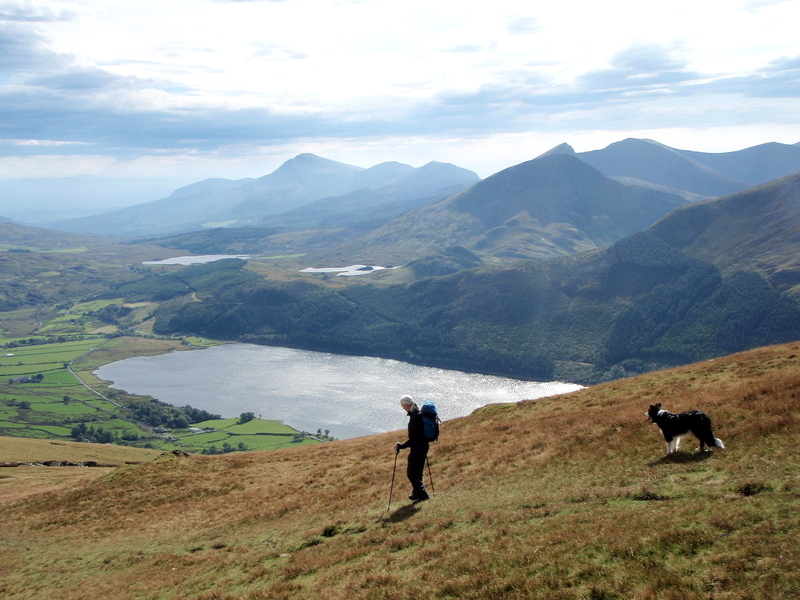 Great views, good walking, what’s not to like! 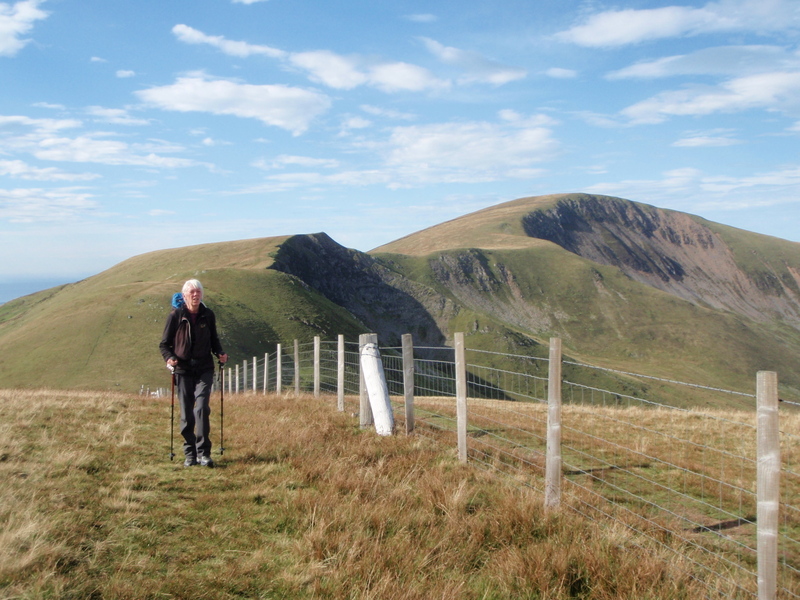 – I can see that Moel Eilio is going to be one of our regular trips. 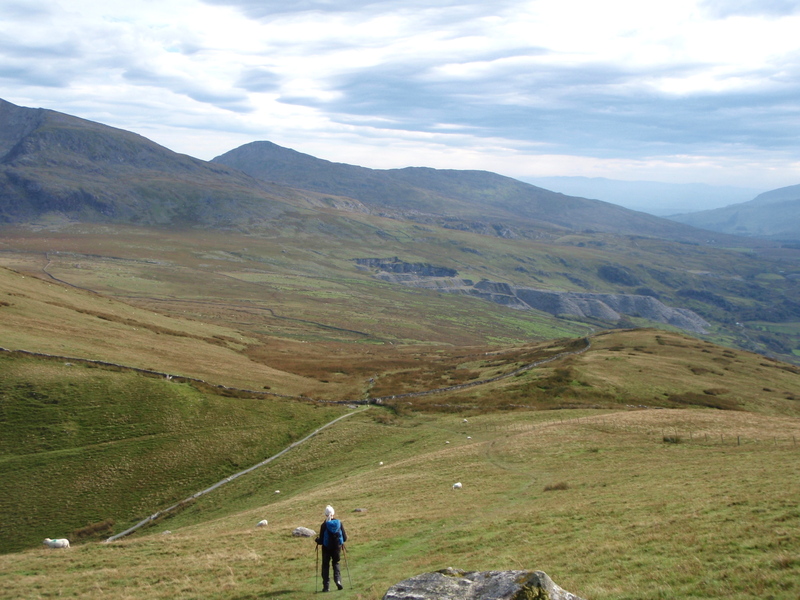 Remember doing Moel Eilio about 15 years ago, on possibly the windiest day in the history of mankind! Our border collie actually got blown onto that fence in your first photo and she was put on the lead very shortly after. 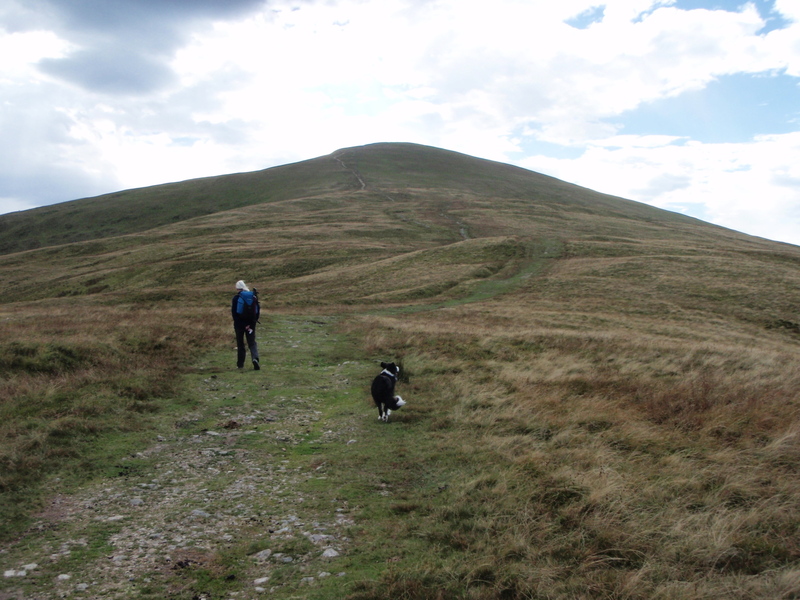 We then ended up crawling for a short while, before finally giving up and going back down! Time for a return trip then Chrissie – highly recommended! wow! are you sure you weren’t on the Howgils by mistake – looks very much like them Paul. But honestly a superb set of photos and a really interesting description…excellent! 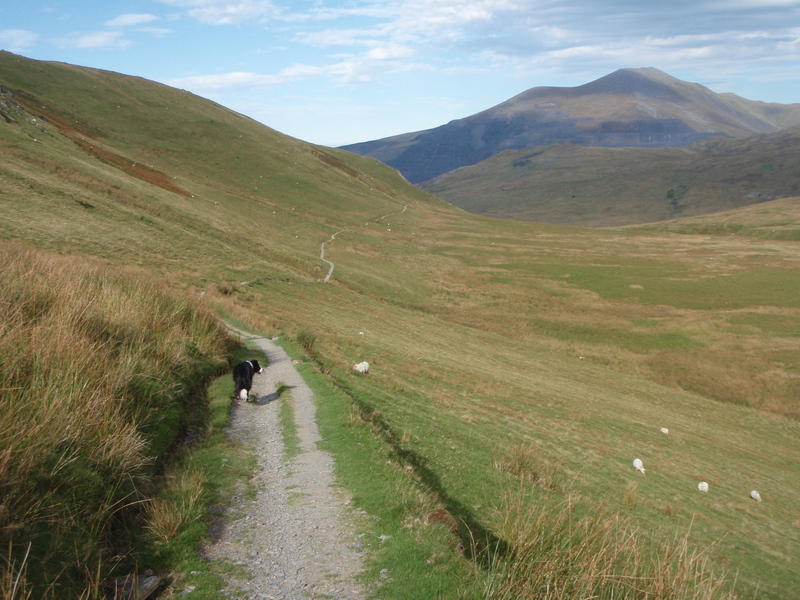 Thanks SP – yes, at times like the Howgills, and the Foel Gron escarpment reminds me of the Brecon Beacons, but the sublime views could only be Snowdonia! 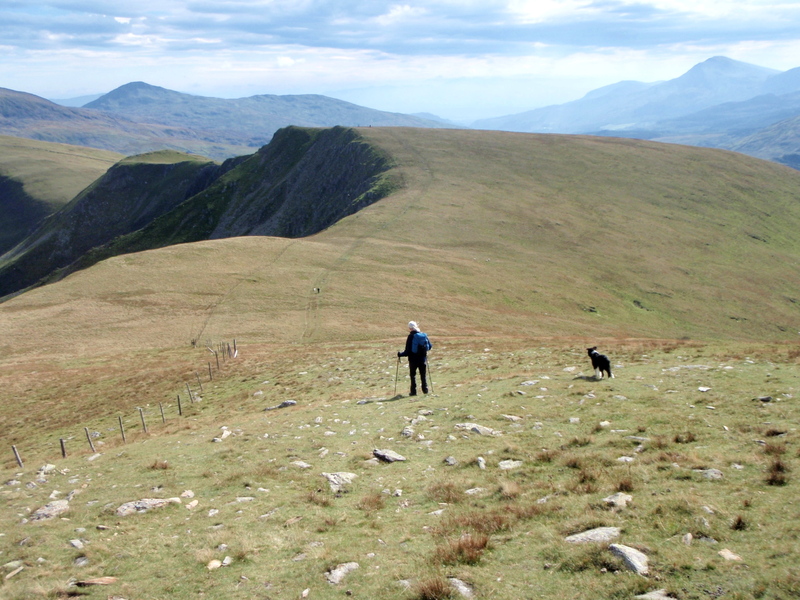 That photo looking back to Moel Eilio – I went up the ridge in front of Moel Eilio once and it was probably more fun than the long slog. 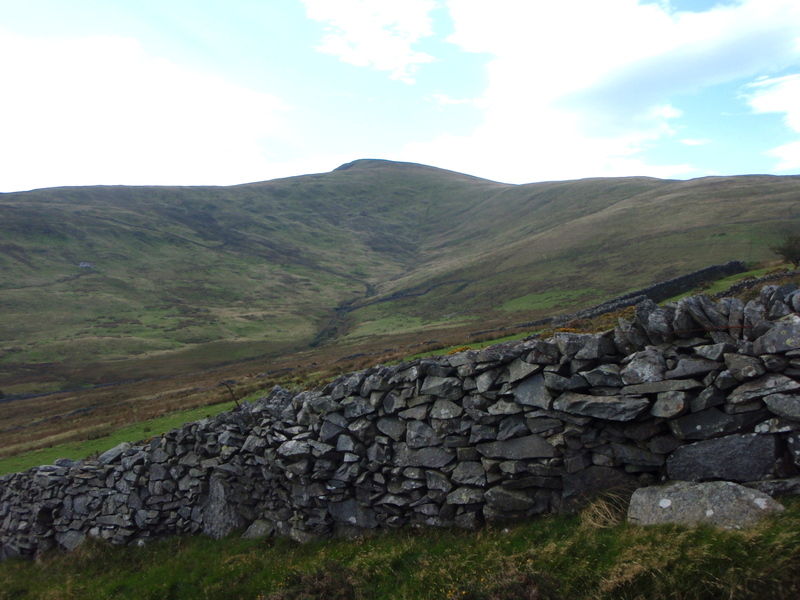 If you keep left of the fence (which I did), it gets quite exciting near the top. I find it a pleasant ridge up but it has a very steep section at the start… it’s a very nice hill! 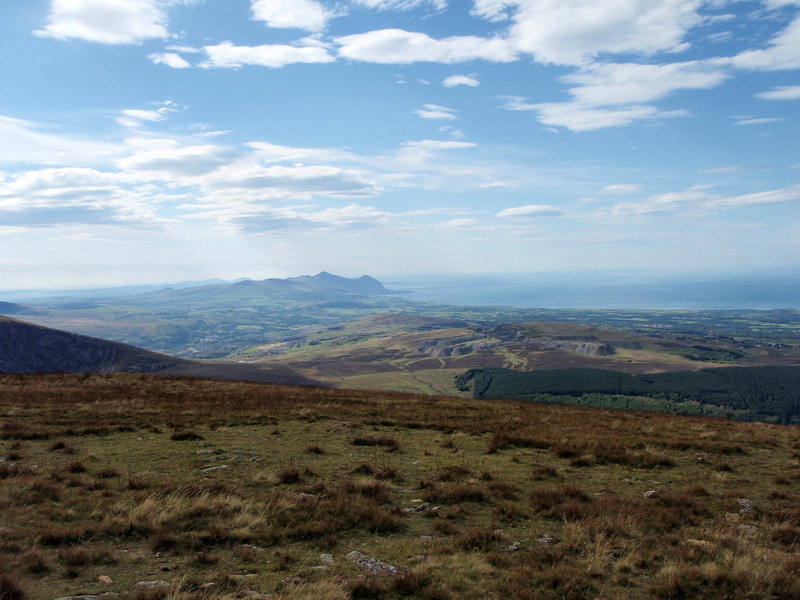 Glorious day for it, Paul, and superb views especially down the Llyn peninsula to Yr Eifl – many memories of happy beach holidays in Nefyn and Abersoch. 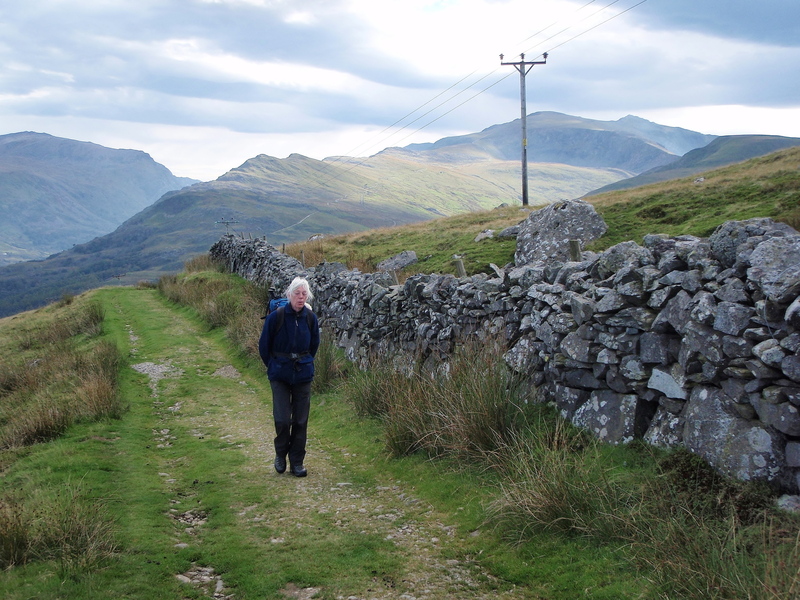 We’re up in the Lakes (getting wet), I must check this post out again when back home against the map. 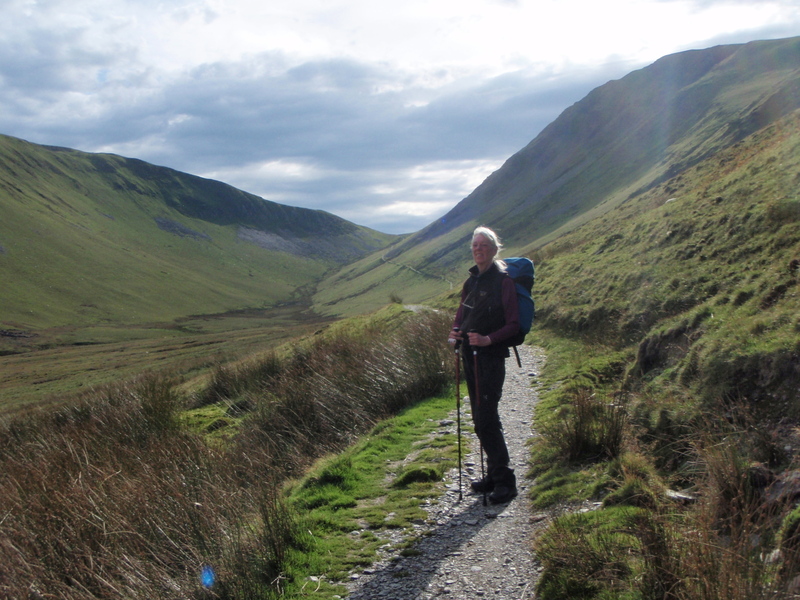 North Wales is a wonderful place to be Andy, though I have the occasional wistful moment thinking about the Lake District – I lived in Cumbria for 25 years, and still enjoy getting back there. Are you anywhere near Bavaria? Chris and I walked in the mountains there once, and it’s beautiful! !